We have just released update 1.14 for Airport Madness 4. Those who have purchased this game can update directly from the main game page. We have also published a free version of Airport Madness 4 on facebook as well as our website (the facebook version is a bit smaller, due to the space constraints of facebook, but the site version is a full 1024×768. Airport Madness 4 has moved over 15 million airplanes to date, and we plan to unlock content in the free version as we achieve certain milestones. Okay, here is an exhaustive list of everything we have in the pipeline for you this year. Please be sure to buy each and every one of these 🙂 Well, at least give the free versions a try. We are planning an update for Airport Madness 3 in March, fixing framerate performance issues, as well as difficulties users are reporting with the ability to click on aircraft. In April we plan to add an additional ‘Easter’ level to Airport Madness 4 (free and full versions). Look for similar updates at Halloween and Christmas! In May we are planning an update to our iOS Airport Madness, adding airports and features. In June there will be a major update to Radar Chaos, as well as an ‘enroute’ version of Radar Chaos. The enroute version will be more simulation than game. There is a great deal of work here at Big Fat Simulations that will keep us busy indefinitely. We are already in the planning stages of the next Airport Madness, due next Christmas, and it should be a great deal of fun. 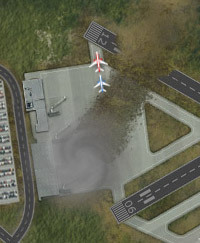 This entry was posted in Airport Madness 2, airport madness 3, Radar Chaos on February 5, 2012 by admin. Here is a clip of an emergency that occurs in Airport Madness 3. A tornado destroys a runway, a terminal building, and three jetliners. Airport Madness 3 can be purchased here. This entry was posted in airport madness 3, videos on December 22, 2010 by admin. I’ve received a number of emails from air traffic control game fans who really enjoy the musical piece from Airport Madness 3. I myself love this piece, although after testing and playing the game nearly one thousand times, I’ve begun using the game’s mute feature. In fact, muting is something that many game players do. Some prefer to listen to music of their own, while others want no distraction during game play. When you develop a game, there are several ways to obtain music. If you are on a budget, there is royalty-free music everywhere, made by musicians trying to make a name for themselves. Some ask that their name be mentioned in the game credits. Others simply give it away. In my experience however, you get what you pay for. The truly decent music costs money, typically between $10 and $100 for a decent 45-second music loop. Last April I went in search of music for Airport Madness 3 and immediately stumbled upon a piece from the air traffic control movie, “Pushing Tin”. Although the movie left something to be desired, the opening intro scene was fantastic. Anne Dudley’s “He Pushes Tin” sounds absolutely incredible when played with the sounds of jet aircraft arriving and departing. I would have used this song for AM3 if it were not for the excessive cost. I instead had a piece created specifically for AM3, with similar energy, that compliments the game nicely. As we plan our future projects, music will likely exist only during the game intro, with perhaps only a quiet musical background beat during game play. This entry was posted in airport madness 3 on December 17, 2010 by admin. Airport Madness 3 has been online for exactly five months now. On Facebook the free version has been played 1,207,555 times, and another 3,523,562 times on game portals worldwide, for a grand total of 5 million plays in 5 months. As you can see by the graph below, Airport Madness 3 had a very exciting summer. But in early September, I received a very friendly email from Facebook indicating that my application violated one of the facebook terms, in particular the part about not posting to people’s news feeds without explicit user consent. I was very quick to correct that, but as you can see the app’s success has suffered as a result of this correction. Facebook applications are scored by a number called “Monthly Active Users”, or MAU. Airport Madness 3 on Facebook reached it’s all-time highest MAU on September 8, 2010 having 162,000 users. Over the following 6 weeks it would plummet to 54,000. Luckily, over the past month it has risen 10% from that low, daring to break 60,000 this week and projecting to break 70,000 by the New Year. Game development has a huge learning curve. It takes only months to learn how to program a game, but it takes years to learn how to promote and distribute your game. This entry was posted in airport madness 3 on November 23, 2010 by admin. Reduced “continuous play” traffic levels . There are many more changes coming, but these are the ones that we felt needed to be done right away. Plus, it gives us an opportunity to test the game’s auto-update feature. Updates are free, by the way. Those who purchased Airport Madness 3 Build 1.0 should see the message, “An update is available” appear at the bottom of the game screen. This entry was posted in airport madness 3 on July 11, 2010 by admin. Landing lights for night aircraft. If you would like to add anything to this list for build 1.1 (full version), please contact us. Updates are free to those who have purchased. The application automatically checks for updates each time you play. This entry was posted in airport madness 3 on July 4, 2010 by admin. After more than eight months in the making, Airport Madness 3 is now available for purchase. Like it’s predecessors, AM3 also includes a free ‘lite’ version, which limits players to one level and just one mishap. The lite version also has a much smaller screen size. The full version is a substantial step upwards from the lite version, and I certainly hope that you enjoy playing it. I would like to thank the following volunteers for their extraordinary efforts in assisting with the beta testing. Without their assistance, this project would not have been possible. This entry was posted in airport madness 3, videos on June 30, 2010 by admin. I’ve received some great last-minute ideas that I decided to implement, including several emergencies. The tornado was not my idea, but that of my young son. He was insistent that it would be a crowd-pleaser, and even sketched out his vision of an air traffic control supervisor who warns of approaching doom. This entry was posted in airport madness 3 on June 22, 2010 by admin.